People with physical disabilities who require wheelchairs for mobility literally feel every bump in the road as their chairs encounter obstacles as seemingly insignificant as cracks and uneven surfaces. A day filled with constant vibration and jolts from these hindrances causes fatigue and can produce spasms in riders that require treatment with medication. While on a ski trip, a chance encounter with a quadriplegic rugby team and a late night discussion about their wheelchairs led Mark Chelgren to found Frog Legs and develop an alternative to the traditional rigid casters used for the front wheels on wheelchairs that allow them to make tight turns. Instead of fixed forks that require the wheel to move up and over obstructions – bouncing the rider in the process – Chelgren designed his forks with a patented pivot point and wedge shaped shock absorber that allows them to move over impediments in an arc path, functioning much like airplane landing gear, smoothing out the ride. 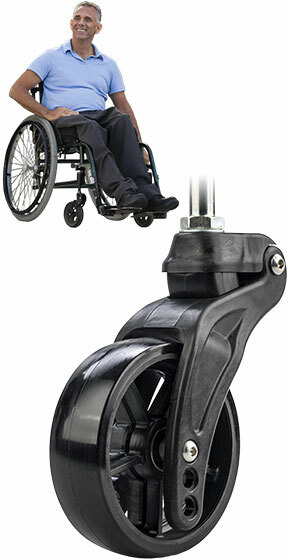 Testing performed by the Center for Industrial Research and Service at Iowa State University showed that 80% of the vibrations wheel chair riders experienced were created by the front caster wheels and that Chelgren’s design improvements reduced those vibrations from being transmitted to the wheelchair frame by 76%. Frog Legs’ second generation caster wheels make use of two different long carbon fiber reinforced composite materials supplied by thermoplastic composite technology firm PlastiComp of Winona, Minn. Machined aluminum has been replaced by a long carbon fiber reinforced nylon 6/6 composite in the wheel forks and a long carbon fiber reinforced thermoplastic polyurethane in the wheel hub. Changing from aluminum to long carbon fiber reinforced composites reduced the weight of a pair of Frog Legs caster wheels by one-third – over a half pound (280 grams) lighter – a reduction that will be noticeable and appreciated by riders. 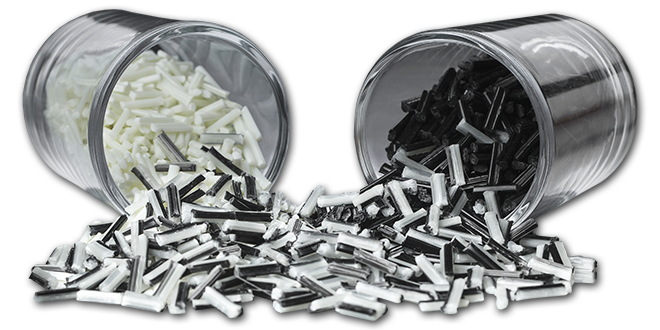 The new design and materials passed RESNA (Rehabilitation Engineering Society of North America) industry standard testing that put them up against million cycle impact and drop forces. Frog Legs went on to test them to failure to have data to compare with traditional metal caster wheels. Frog Legs’ shock absorbing caster wheels are not just a solution for wheelchairs, they can decrease vibration in all types of rolling equipment where there’s a weight versus performance equation, according to Chelgren. Family-owned and operated, Frog Legs designs and manufactures its caster wheels in Ottumwa, Iowa. For more information, visit their website at froglegsinc.com.